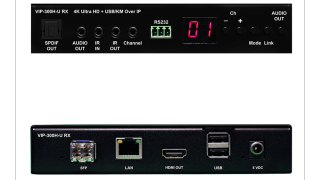 The What: The PureLink VIP-300H-U Ultra HD/4K HDMI and USB/KM distribution system is PureLink's newest addition to its line of PureStream IP Video Solutions, and is designed to allow users to easily manage media distribution and matrix switching over IP. The What Else: The VIP-300H-U IP video solution transports 4K signals across both category cable and fiber networks. Together with the advanced VPX IP video management software, it allows users to create any-size matrix systems. Features include video wall support, with a built-in video wall processor that enables setup of displays up to an 8x8 configuration, and VPX IP video management software that allows users to set up, configure, and monitor large-scale systems. It is designed for reliability, with modular transmitter and receiver modules, and can be combined with PureLink's VIP-NET purpose-designed network switches for optimal performance. Using PureLink's proprietary PureStreamX Ultra codec, the VIP-300H-U transports Ultra HD/4K content at low data rates, delivering high-quality video performance over existing IP networks. The Bottom Line: The VIP-300H-U combines powerful connectivity, simplified integration, and more features to optimize reliability and flexibility. From point-to-point extension to large-scale matrix switching systems, the VIP Series aims to bring simplicity and versatility to applications demanding AV and IT convergence.